Motley Crue frontman Vince Neil is featured in the latest video preview of NBC-TV’s The New Celebrity Apprentice with host Arnold Schwarzenegger ahead of its premiere on January 2. 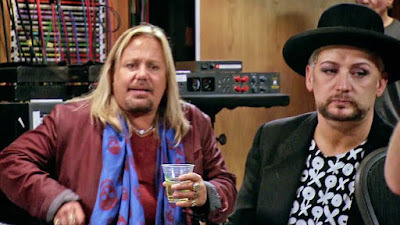 Neil’s drinking during a task in the show’s second episode sees him clash with Culture Club singer Boy George, when the team is asked to create an original song and video for a toothpaste company. “I’m way over 21,” responds Neil, whose history with drugs and alcohol abuse features a series of DUI convictions that includes a 1984 fatal collision where his actions killed Hanoi Rocks drummer Nicholas “Razzle” Dingley. Earlier this year, the rocker pled guilty to misdemeanor battery charges in Las Vegas stemming from an incident in the city on April 7. Neil joins the reality program now overseen by Schwarzenegger since the network parted ways with Donald Trump in 2015, although his name will reportedly remain among the show’s credits. One of the first to sign on for the revamped series, the Motley Crue member sets a charity fundraising record during the season that sees him compete alongside boxing campion Laila Ali, TV host Brooke Burke-Charvet, NFL star Eric Dickerson, American Ninja Warrior host Matt Iseman, actress Carrie Keagan, stylist Carson Kressley, WNBA champion Lisa Leslie, comedian Jon Lovitz, former reality TV star Nicole "Snooki" Polizzi, actress Kyle Richards, UFC star Chael Sonnen, TV host Porsha Williams, NFL legend Ricky Williams and singer Carnie Wilson. Neil has been on the road playing dates across North America this year after Motley Crue wrapped up their farewell tour at the Staples Center in Los Angeles last New Year’s Eve.